In order to keep communities safe, law enforcement capitalizes on a number advantages it has over criminals — from training to equipment to an unwavering commitment to upholding the law. In recent years, police departments nationwide have come to rely more on technology as one of their primary advantages. In particular, portable satellite systems are enabling them to keep stakeholders in direct contact with one another and to send and receive more data faster than ever before. 3D laser crime scene scanning. These systems provide highly accurate measurements and imaging at crime or accident scenes, simplifying and expediting the collection of this critical information. Through-the-wall radar. Able to detect movement within a building or room as slight as human breathing, this type of radar is making it safer for officers involved in apprehending criminals or rescuing hostages. Body-worn cameras. We have all seen dramatic footage from body cameras. This data can help investigators determine exactly what happened when an officer engaged with a suspect. Portable satellite systems. Effective communication is one of the most valuable tools that law enforcement has at its disposal. Because incidents can take place anywhere, anytime, a powerful mobile hotspot is often critical to the successful resolution of an emergency situation. 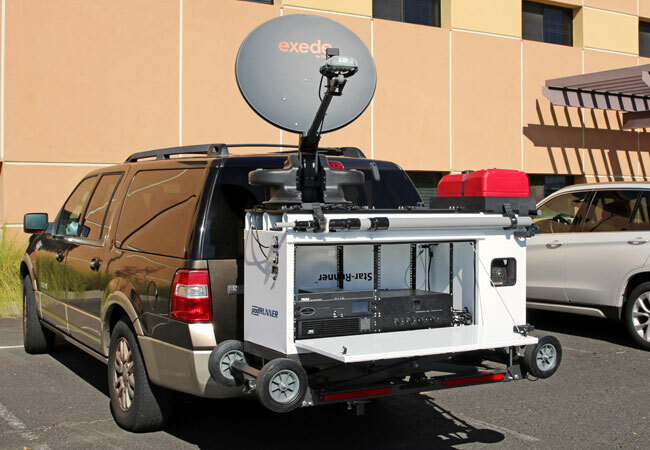 Thanks to improvement in satellite speeds and Ka-band connections, it’s easier than ever to deploy portable satellite systems in-the-field. When these kinds of resources are used in concert, they provide incident commanders, emergency managers and others in law enforcement with tremendous leverage in dealing with criminals and emergency situations. How can a portable satellite system help your department or agency? The best way to find out is to call us at (888) 427-3728 or email info@ThePodRunner.com. We can provide you with in-depth information on our Star-Runner™ system that is used by organizations of all kinds to keep the lines of communication open under any conditions.